Ultimate stand-mount vocal processor gives you simple and fast studio-quality sound with expandable effects and keyboard input/output. Built-in Adaptive tone plus sweet harmony, reverb, and echo effects let you quickly create pro studio quality vocals. Beam additional effects onto three preset buttons, choosing from hundreds of available presets, to perfectly fit your musical style. ¼ -inch stereo keyboard input/output lets you have more control at your fingertips with MIDI note and continuous control entry. Multi track 4-in, 8-out USB audio interface for easy recording. Easy hit function in beamed presets turns on layered effects with a single button press. 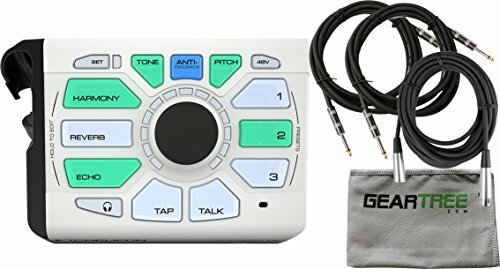 Intelligent mic input gain for quick and painless setup. Powerful anti-feedback stays on alert for feedback and stops it automatically. Effortless auto-chromatic pitch correction helps you sing in tune. Room sense mic lets you practice without a mic and automatically controls harmony. If you have any questions about this product by TC-Helicon, contact us by completing and submitting the form below. If you are looking for a specif part number, please include it with your message.